Hello and thank you for coming by. 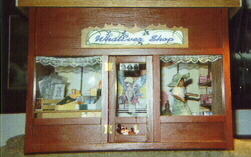 On this page you will see my 'WhatEver Shop' and my Wonderful Doll. I hope to change these pictures once in awhile. The top picture is my 'WhatEver Shop' I put a number of different things in there and change it for the holidays. The grandchildern and neighbor childern love to come and see what is new in it and when I am later changing things they help. The bottom picture is of my doll. Meg. She was made for me by Wolfie of 'Lone Wolf Mini Creations'. Isn't she wonderful. She is home now and on her bed. I can't begin to tell you how beautiful she is. She is going to live in the rooms above the tavern I am making. More Miniatures .. A must see! Some places to my things I make. As will as links to see my favorite people and places.